Panchalingeshwar Temple is in Balasore district of Odisha. 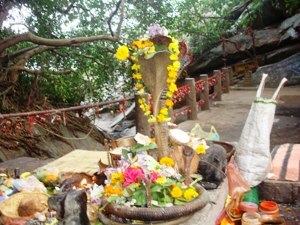 It named after the five Shivalinga that are enshrined inside. The temple is on top of a hillock near the Nilagiri hill (not to be confused with that of Western Ghats). The Shivalingas are said to have been enshrined by Sita, the wife of Lord Rama during their exile. Another story holds that King Banasura worshiped the Swayambhu Lingas at this place given its beauty. A perennial stream, which is the main attraction of the area, regularly washes the Shivalingas as it flows over them. To reach to the temple one has to lie flat on the rock parallel to the stream to touch and worship the lingas inside the water stream.Panchalingeswar is 30 km from Balasore and 85 km from Baripada. There are regular transport facilities between Balasore and Baripada.